Immediately, the convoy spread out, finding clean air amongst the dry, fine Sahara dust being kicked up by the convoy lead. And then, everyone put their foot down. With a slight kick from the unloaded rear-end, I made the most out of the diesel engine and was doing 120 km/h in no time. Never has my confidence been so high in a terrain so unfamiliar, but seeing the five-strong convoy speed towards the town just beyond the horizon gave me a boost knowing there were people out there with a stronger death wish; after all, it’s not every day you get to drive a stage of the Paris-Dakar Rally. Two days prior to this memorable drive, the situation was completely different. I was beginning to question my sanity: I was halfway across the world, alone, in a place that spoke little English. Fate would have it, that because of last-minute preparations, I had to fly into Morocco ahead and separately from the rest of the Asia-Oceania group. At that point, I felt the tagline of the event summed up my feelings: “Push the Limit”. Still, in-between conserving my phone battery (I forgot to bring an adapter) and living off the spotty internet signal, I figured I didn’t have it as bad as the Navara’s engineering team. 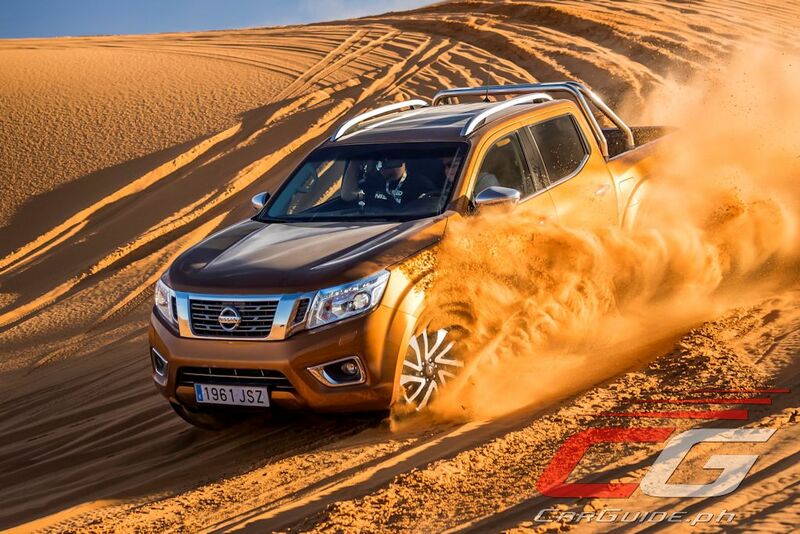 Nissan is mighty proud of the new NP300 Navara, and they have every reason to be. Built atop 80 years of pickup expertise, the Navara has undergone extensive testing in some of the most remote locations in the world. Built around the adage of “Tough, Smart”, the Navara has proven its worth—crawling the forests of Norway, the snowy flatlands of Sweden, the limestone mountains of Majorca, Spain, and of course, the sand dunes of Morocco. Yet, I’m sure the saying is also true for the engineering team as the varied terrain offers breathtaking views with bouts of loneliness tossed in-between. But the result is certainly worth it. Understanding the ever-changing demands of the increasingly sophisticated pickup truck owner, Nissan has engineered the Navara to take on a dual personality. It offers a comfortable and convenient life on board, yet the stiffer fully-boxed frame is made to withstand the punishment of intense daily use. Plus, understanding that customer needs vary from region to region, Nissan isn’t forcing the same engine configurations on all markets. Yet, they’re all designed to offer two things: power and fuel efficiency. Whether it’s Europe with its twin-turbo 2.3-liter diesel or Asia’s single-turbo 2.5-liter diesel, the outputs are the same: 190 horsepower and 450 Nm of torque. Thus, there are no compromises to ability: a one-ton payload and a three-and-a-half ton towing capacity. This is a perfect example of Nissan striving to have a global presence, but a local flavor in every market it’s in. And it seems that strategy is paying off. This year, the Navara is responsible for Nissan’s staggering growth in the Light Commercial Vehicle (LCV) segment by 31 percent globally. And in that product segment, the Navara’s role is expected to grow from 28 percent to a whopping 55 percent by the end of this fiscal year. And beyond its contribution to sales, the Navara won the coveted International Pickup of the Year award, besting stiff competition from the Mitsubishi Strada and Ford Ranger. After ten kilometers of driving flat out across the dunes, I reached the nameless town at the horizon. With a quickened pulse and a wide grin sprayed across my face, the troupe soon re-grouped and moved into the town. Almost immediately, kids in mountain bikes started pulling alongside the Navara, asking for alms. Opting not to mind them, the group moved through the town and onto the day’s most challenging activity: driving on the sand dunes. Having done this sort of testing before, Nissan figured why not do it again, but this time, bring the media along for the ride? With the only modification being a lowered tire pressure (21 PSI to 14 PSI), sand dunes offer the most exhilarating, but challenging terrain for any 4WD vehicle. Ultimately, it becomes a test of usable power and traction, two things the Navara has in stride. Opting to slot the automatic into manual mode, I found it easy to keep the engine singing at the optimal 3,500 rpm. After that, it’s all up to the Navara and its host of advanced off-road features. 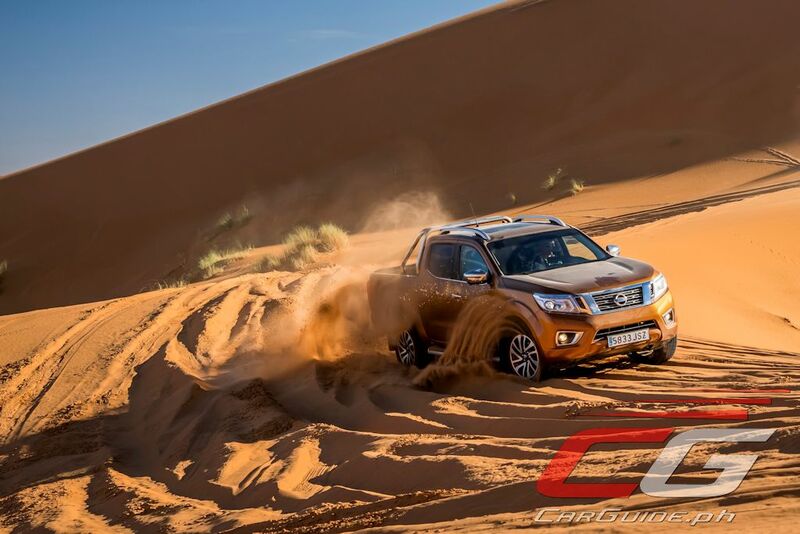 With a ride height of 224 millimeters and a maximum ascending grade of 30 percent, it can make short work of the dunes, provided the person in front has the same confidence in the vehicle as you. If not, you’ll be the one getting stuck as a result, as I found out twice in a span of 11 kilometers. Still, some coaching (and quick digging work) was all that’s required to get me out. As the sun began to set, the Moroccan sands turned a bright, golden yellow. Perfectly matching the hue of the Savanna Orange NP300 Navara, it’s time to set off back to the hotel in Arfoud, some 182 kilometers away. Going back to on-road tire pressure, the convoy soon reached a two-lane patch of paved road that appeared like an oasis in the middle of the desolated, sandy countryside. Wanting to stick to the tight schedule, everyone pushed well beyond the posted speed limit. Through all this, the Navara simply obliged with its surprising stability and surefootedness through the progressive curves. The program ended with an authentic tagine dinner, and yet, all I could think of that night was to go home—to go to a place I’m familiar with, to the people I love, to the tastes I’m familiar with. At the same time, I have a newfound appreciation the Nissan engineers who were with us during the drive. For them, the job isn’t over. Since they built their first pickup in 1933, over 14 million customers around the world have come to depend on a Nissan pickup to transport their families, workmates, and cargo, sometimes in the most remote and desolate of places. Being the lifeblood of their communities, pickups need a broader range of abilities than almost any other vehicle. Engineering a good one isn’t easy but it’s clear that the accumulated 80 years of pickup know-how is present in the NP300 Navara. It’s simply not a good pickup, it’s a great one.